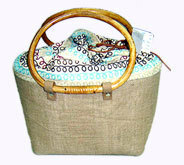 All the bags under this category are made of various type of material including; straw, canvas & jute. 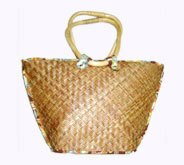 These bags are designed to perfection & exhibit all the qualities that are associated with bags. Apt to be used for various purposes, there bags are not at all costly and available with us in various sizes, shapes & designs. Desc : Perfect fusion of tradition & modernity. Expertly developed in striking patterns, designer handcrafted jute bags having blue, red & yellow stripes enchant everyone with their lovely appearance. 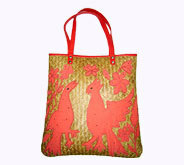 Desc : Vertically elongated jute handbags are furnished with red colored designs of birds & flowers on golden background. They possess two red soft straps for holding. 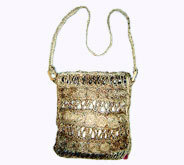 Desc : Passion to deliver the best & stylish products to customers completely reflects in these jute shoulder bags. 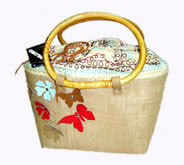 Attractively designed these jute bags are the choice of many. 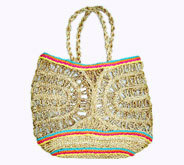 Desc : Bucket shaped jute fashion bag depicts the multicolored designs of flowers and butterflies. They are attached with oval wooden handle to ensure a long shelf life. Desc : Great for shopping purpose. Displaying red & silver floral designs, this bucket shape jute shopping bag having strong handles impart a fashionable look to the girls & ladies. 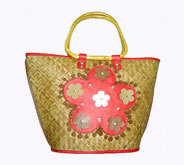 Desc : To bring a touch of style & beauty while going to party, this appealing jute party bag is must. Colorful floral designs & comfortable straps make this bag really eye catcher. Desc : Wonderful synthesis of quality and beauty. 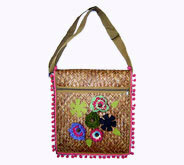 Ladies jute bag having meander designs and multicolored border tempts women folk with their incomparable charm. Desc : Proficiently developed with creative evolution from premium standard jute canvas, fashionable jute bags with oval handles are sure to last for a long time.